You are looking at one if not the rarest set to grace this site. 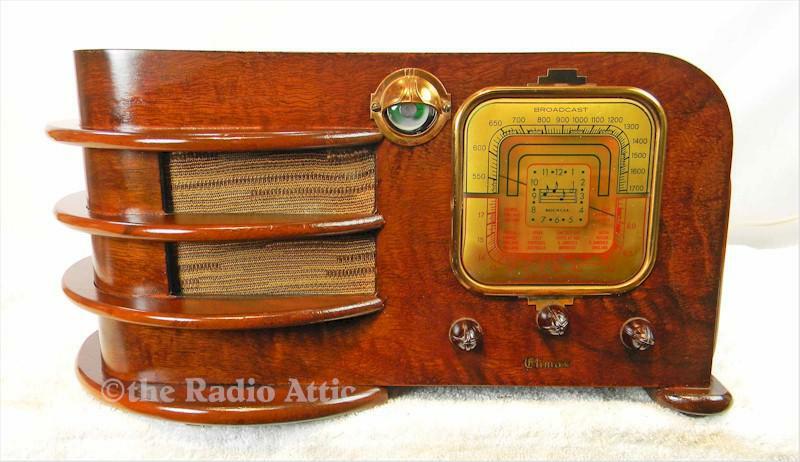 These radios from Climax Radio from Chicago are some of the most collectable Deco radios ever made. The example before you is the finest all original example I have ever seen. The finish, speaker cloth and knobs are all as it left the factory 80 years ago. Even the decal is 100%! Note the perfection of the square dial, which has tremendous detail. These bubble lens are often damaged with no reproductions available; this one is pristine. The radio is a seven-tube super-het chassis which plays on AM and Shortwave. The radio retains a full factory back which is almost always missing. Truly this is a museum quality condition example. Les has completed his professional repairs returning the radio to perfect playing condition. The radio sports a super sensitive new green tuning eye. He has added a mini-jack to the set allowing your connection of any modern device or add a Bluetooth receiver for only $25 for a wireless connection. All of this will allow listening to anything of your choice. This is an expansive radio, but the really great ones always are! 18"W x 8-1/2"H x 9-1/2"D.
You are visitor number 1,923 to this page.